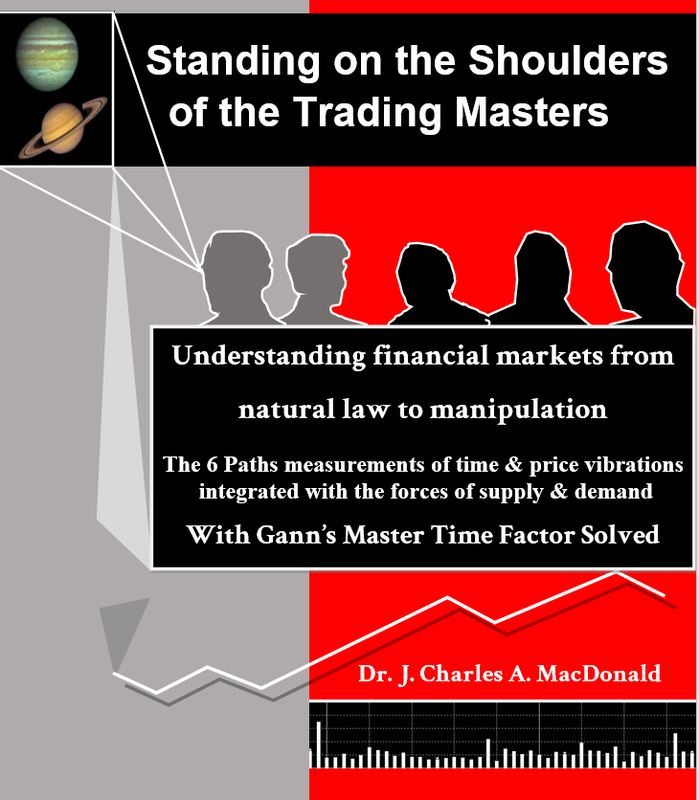 I am now writing a book based on understanding the approaches of a number of the Trading Masters from the last 115 years and building on their approaches with new supply and demand indicators. The book will come out shortly. The new indicators go well beyond my original indicator settings above as I can calculate the gross buying and gross selling volume within bars and across bars so it is very much like understanding a micro economic supply and demand on up waves and down waves. Properly understood and measured supply and demand does drive prices higher or lower. In my opinion, is a much better approach than looking purely at Total Volume or average volume waves. The indicators can be used in conjunction with other techniques that in the past only relied on time and price dimensions e.g. Hurst Cycles, Elliott Wave, and Merrill Filtered Waves etc. Below I show a few of the new indicators on charts. The historical context for the development of the indicators is covered in the book but not below. Top Left chart shows the 4 options for what I call a Forensic supply and demand indicator that has a nominated start date and then shows the average supply and demand or the total supply and demand or the marginal supply and demand, or the netted off marginal supply and demand from the start date. Top right chart shows analyses of three ranges using a Gross buying and selling volume wave indicator and a netted off buying and selling volume wave indicator. The text relates to various Wyckoff type marker/analyses from the chart patterns. Bottom left is using the Forensic supply and demand indicator to analyse a famous Elliott Wave expert's analysis of the DJIA and calculating where the end of a EW should end based on micro economic supply and demand. (EW analysis normally does not involve volume in the calculations). 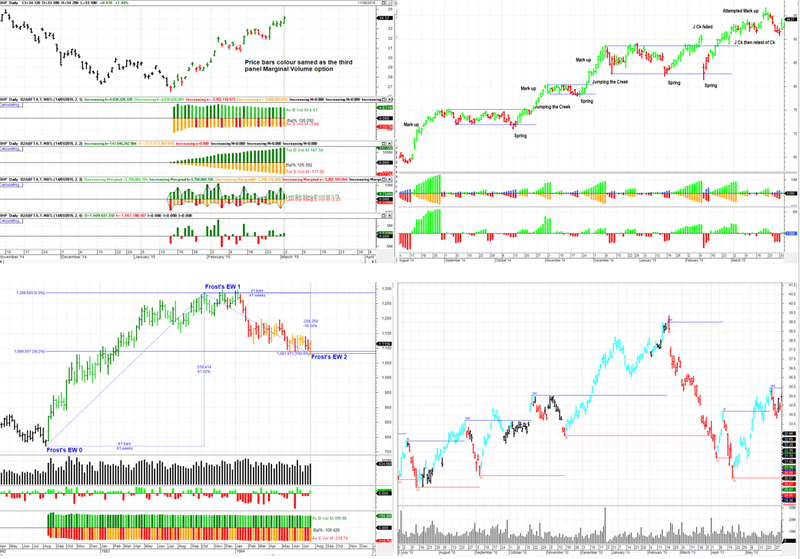 Bottom right is a chart where the price bars are coloured based on supply and demand using supply and demand benchmarked statistics obtained in the past prior to the commencement of the bars on this chart. So history repeats based on a supply and demand analysis of the past. Top left chart is showing a Smart Money Detector indicator with a bar by bar setting to analyse supply and demand on each bar. Bar by bar supply and demand is too hard to make much sense. 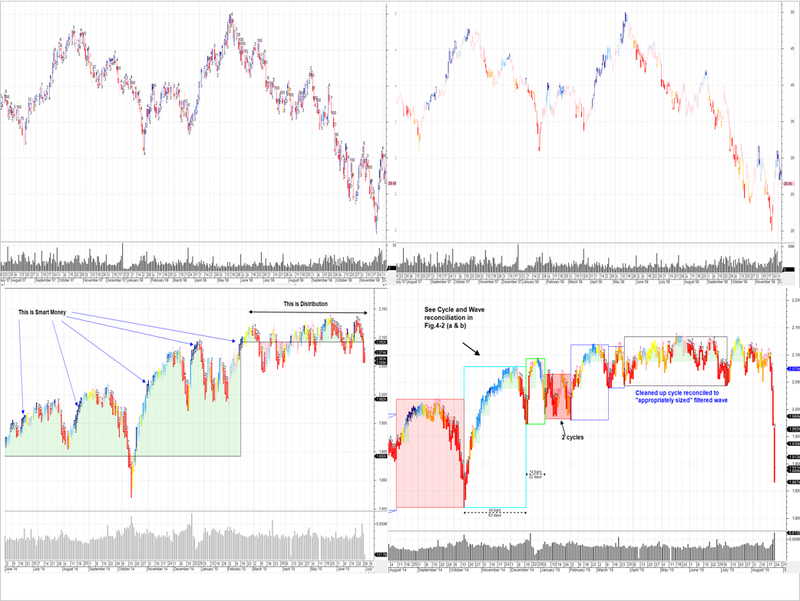 The Top right chart is exactly the same indicator but using a higher MA setting for calculating the supply and demand across bars - now you can more clearly see where the buying and selling energies are moving the markets up or down. Bottom left is where I had been using the Smart Money Detector to monitor the GSPC over last year or so. It is relatively clear where the indicator is showing Smart Money activity and where distribution has been occurring. 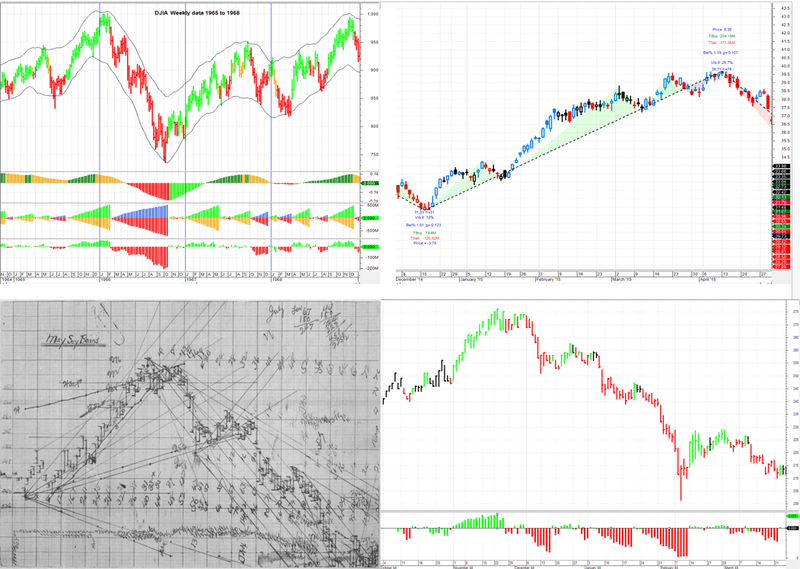 Top left chart is a Hurst envelope cyclical analysis. Hurst Cycles do not usually involve volume analysis. Bottom two panel indicators show the buying and selling volume waves corresponding to the cyclical envelope analysis. Top right chart is a Wave indicator showing the collection of supply and demand and other statistical information for the previous wave legs. The indicator can also collect the averaged statistics sampled from the last 5 to 8 waves. The book is interspersed with various interesting historical chart analysis. Bottom left is Gann's famous May Soybean chart that involved astrological planetary lines and various confusing angles in the Master's analysis. Bottom Right is a wave indicator applied to the buying and selling activity on the May Soy Bean chart. In this case the include volume option was tuned off as but not volume was not analysed in Gann's chart and the volume data for the chart period was not available. The indicator option to exclude volume still simplifies the analysis of what is otherwise a messy chart to try and understand. Single chart just showing how two dimensional price and time data can confuse the understanding of price action but when the real third dimension supply and demand is synchronised with Time and price the chart is more informative. Dear All I had a personal message yesterday and a private message today asking when my book was coming out. I apologised yesterday as it has taken 4 years to write instead of my original estimate of 4 months. It shows how much you do not know when you are forced to test things out. My original reply to this forum disappeared so I converted my copy of the contents page will post it as a separate post hopefully that will work. Also, a draft cover will be a separate post. If I have missed something significant in the contents let me know and I will try to address it before I finally sign off. I hope to finish editing and will send it off to the printers after I read a hard copy next week.